This is one of those special picture books that leaves a lasting impression. It is unique, heartfelt and beautiful. Elise is scared of everything. She doesn’t go out and she cleans her house every day to keep it nice and tidy. Then one day something happens. Something strange flies through her window. A paper plane. That night, she is too scared to sleep. The next day there is a knock at the door. No-one ever knocks at her door. It’s a boy. Looking for his plane. What should she do? The illustrations in this book are just exquisite. Damm uses an unusual technique of producing a diorama of each scene, creating a three dimensional image that focusses attention on the key characters as cut outs juxtaposed against their backgrounds. Her use of colour really brings this story to life. Elise’s house and life are brown and grey. Then the boy appears, with his red cap and shorts, and colour following him wherever he goes. He brings colour and light with him as he explores and plays in Elise’s house. The companionship she didn’t know she needed brings colour to Elise’s own face and to her surroundings. 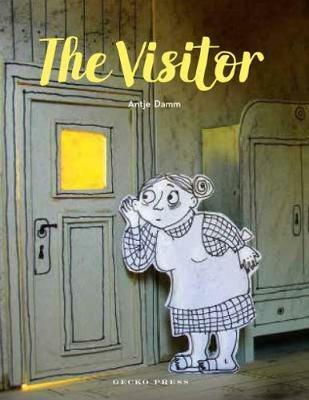 This is a poignant book that touches on themes of loneliness and isolation, and the joy that companionship, especially children, can bring to the lives of the isolated elderly. The boy brings Elise joy, and purpose. And she is changed because of it. The book has been translated from German by Sally-Ann Spencer and published by Gecko Press. It has won the Leipzig Book Fair children’s choice award and the Nimmerland picture book award. This is a stunning book in which the story is told as much through the illustrative interpretation as through the words. Just beautiful.